The U.S. National Guard Association honored nine Hawaii Guardsmen and Medal of Honor recipients with a new plaque on Jan. 28, 2014. From left, Tamah-lani Noh, Col. Ray Macareg, Mjr. Dion Kaimihana, LTC Mark Takai, Col. (ret.) Raymond Jardine, Congresswoman Tulsi Gabbard (HI-02), Mjr. Gen. Darryll D.M. Wong, Mjr. James Wornall, MSG Rose Weldon, M. Kimo Wong, and CMS Raquel Ramos. 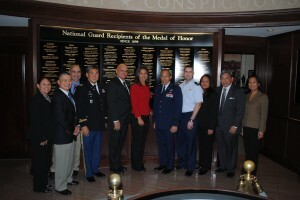 Washington, D.C. (Jan. 28, 2013) — Congresswoman Tulsi Gabbard (HI-02) today honored nine Hawai‘i Guardsmen at the National Guard Association of the United States (NGAUS) as their names were added to the organization’s Medal of Honor Gallery. In 2000, eight of the soldiers received Medals of Honor for their gallantry and valor in combat in World War II. In 2011, an additional soldier was recognized for his valorous service in Korea. The Honorees include: Mikio Hasemoto, Private, US Army, WWII-Italy; Shizuya Hayashi, Private, US Army, WWII-Italy; Yeiki Kobashigawa, Technical Sergeant, US Army, WWII-Italy; Anthony T. Kaho‘ohanohano, Private First Class, US Army, Korea; Kaoru Moto, Private First Class, US Army, WWII-Italy; Masato Nakae, Private, US Army, WWII-Italy; Shinyei Nakamine, Private, US Army, WWII-Italy; Allan M. Ohata, Staff Sergeant, US Army, WWII-Italy; and Francis Brown Wai, Captain, US Army, WWII-Italy. “The Hawai‘i Army National Guard has a proud and deep history of selfless service to our country, and these nine Medal of Honor recipients exemplify the core values we strive for,” Gabbard said. “Their recognition at the NGAUS Medal of Honor gallery is a fitting tribute to these heroes who raised their hands to serve our nation in combat. Now, people from across the country who visit the gallery will be able to further appreciate the sacrifices of Hawai‘i’s bravest soldiers. Gabbard enlisted in the Hawai‘i Army National Guard in 2003 and currently serves as Military Police Captain.